Can the inhabitants of a small fishing hamlet on the outskirts of Iceland join forces and collectively host a music festival that features a whopping 26 bands and artists performing over two days—and do so successfully, without charging admission? (SPOILER: yes. Yes they can). Pumped up and excited, we hit the road early on Easter Thursday to find out. Our destination: the town of Ísafjörður in the Westfjords, where the music festival “Aldrei fór ég suður” (“I Never Went South”) takes place every Easter. Our initial glee turned into awe the moment we left the city behind—we could see the mountains growing bigger, the rivers running deeper and human constructs fewer and farther apart. Towns quickly gave way to rolling hills, white mountains and wide open expanses with not a soul around for miles. When we crossed Steingrímsfjarðarheiði plateau, which leads through the mountains to the Westfjords themselves, dread overtook awe as we got trapped in a whiteout. We might still be there, had it not been for a conscientious middle-aged Ísafjörður man who took the time to pull our jeep out. We crept over the plateau at a snail’s pace, navigated the winding roads and finally, four hours behind schedule, arrived in Ísafjörður. We made our way to the hotel, hugging our beds like long lost sailors returning ashore. Once our nerves had calmed, it was plain to see that the old cliché about the weather changing every five minutes in Iceland holds doubly true in the Westfjords—one moment the sun would bathe Ísafjörður in its gentle spring rays, and the next fierce winds would send icicles flying in from the sides, stabbing your face and eyes like tiny daggers. During those fleeting moments when the weather was good, the scenery was absolutely stunning. The 2,600 person town is flanked on both sides by massive mountains, with a beautiful bay that stretches as far as the eyes can see. The town itself is also very picturesque, and features some of the endearing trademarks shared by many small towns, such as a burger joint that also serves as a musical instrument store and super market. You can get anywhere in Ísafjörður from the centre in about fifteen minutes walking, leaving little excuse for tourists not to explore everything the town has to offer. Even as the town became bloated with out of town festivalgoers, the proud inhabitants remained friendly, and perhaps more importantly, patient, as visitors inefficiently queued at the liquor store, the local Subway sandwich shop and the grocery store. Although I am certain the bakery staff were frustrated at the indecisiveness of some of their new patrons during the lunch rush hour, they remained talkative, helpful and upbeat. The festival, now in its eleventh rendition, was held at a warehouse at the edge of town, with “rokkstrætóinn” (“The Rock Bus”) ferrying people from the town centre for free. The locals handled security and manned the food booth, happily passing the time by chatting away to their neighbours. It felt like being at a big family reunion, with children of all ages scampering around and singing along to the more child-friendly songs, parents chit-chatting between sets and teenagers drinking copiously, bragging about being able to stomach their 180 proof moonshine (that’s 90% ABV, folks). What was apparent was that this was a local festival, run by local people—a cooperative community event where guests are expected to behave decently. As the afternoon turned into evening, a boisterous announcer armed with a wooden sword and shield shouted over the crowd that children under the age of 12 needed to be tucked away or accompanied by adults, and that everyone else should go have hot dogs and fish stew. After a few appearances, he had riled up the crowd and gotten them to join him in chanting slogans, rules of the festival and consumerist propaganda, urging the audience to purchase food from the vendors and make sure no one smoked in the venue. Just before the children were taken home, the magnificent Páll Óskar moonwalked across the stage, singing about a better world and love, all the while launching confetti all over the crowd while dancing fabulously. Friday’s concert was full of highlights including Mammút’s high octane performance, Icelandic rock legends Maus playing some of their best hits and Cell7 performing with a full band as she ripped through her tight lyrics about feminism and matters of the heart. Hermigervill closed the show in style, rocking away through his 8-bit theremin-infused set, only to then keep the party going at local club Krúsin straight afterwards. The Saturday show started on a more downbeat note, with Iceland’s greatest cover band Kaleo playing everything but the song that made them famous. 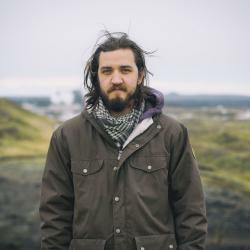 The punk-poets of Grísalappalísa, however, upped the ante when frontman Gunnar Ragnarsson leapt recklessly into the crowd while the band vigorously jammed on songs about the coming of spring. DJ Flugvél og geimskip took those gathered on a journey that was out of this world, and the Aldrei fór ég suður house band, comprised of festival creator Mugison and several others, brought the roof down with the one song they played. Hjaltalín massaged the crowd’s eardrums with their gentle melancholic sound, only to have Sólstafir unleash the pent-up frustration of all the angst-ridden teenagers in attendance. This in turn created the festival’s only mosh pit, and it was as massive as it was ferocious, engulfing everyone close to the stage and persisting until the end of the set. Retro Stefson then got the whole crowd jumping hazardously from one side to the next to their brand of joyful Euro-disco, closing the festival with with crowd pleading for more. At the end of it all the crowd was kindly asked to vacate the premises as the local staff would really like to get to their homes at a reasonable hour. The weather remained mercurial the following day, as festivalgoers soaked away their hangovers at the local indoor swimming pool, and then head back south in an orderly fashion. Aldrei fór ég suður demonstrates yet again how festivals can be successful and fun without being opulent or commercial. This communal project shows no signs of slowing down or selling out, providing an oasis of country-style enjoyment during the Easter weekend. Accommodation provided by Hótel Ísafjörður, book accommodation online or call +354-4564111. Car provided by Hertz car rental, book online.